Hi, can you please send me instructions on how to change the printer cartridge for my LaserBase MF5750? Thanks, Katherine. We can help to make your money go longer just by increasingly being extremely aggressive on the price of Canon MF5750 cartridges. All of our Canon toners are manufactured to stringent standards to ensure you get complete customer satisfaction. Do you still have uncertainties about our products? If you are determined to reduce costs it makes sense for you to make use of our free next day delivery that'll cut the cost of buying Canon LaserBase MF5750 toners online. We stand over any order for high quality MF-5750 toner cartridges with a rock solid money back guarantee to be certain of effective operation. Cartridge Save are happy to give you a complete reimbursement in the very unlikely event that a Canon MF5750 toner cartridge doesn't operate as it should, why then be satisfied with something less? With the Canon LaserBase MF-5750 multifunction printer, home users and a small business can cut down printing costs. The all-in-one Canon MF-5750 LaserBase printer offers the convenience of a copier, scanner, fax machine, and a printer in one compact machine. The Canon LaserBase MF-5750 is a desktop business centre that is easy to use and fairly affordable, but it can be disappointing in terms of overall print and scan quality. This is a fairly compact machine with an understated frame and a busy control panel, which includes a numeric pad and one-touch operational buttons for ease of use. Users can be guided by the small display screen, which is slightly angled for a better view. 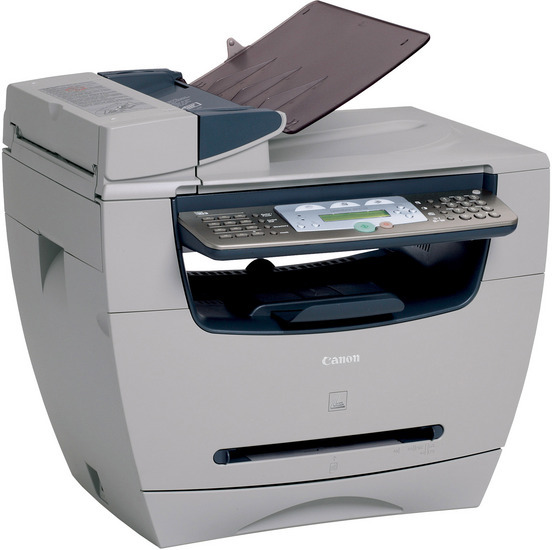 The topmost part of the Canon LaserBase MF-5750 all-in-one laser printer is mostly dominated by the automatic document feeder attached to the flatbed scanner. The LaserBase MF5750 mono laser printer offers super G3 fax and a 1200x2400dpi CCD scanner with 48/24-bit colour depth. The Canon LaserBase MF5750 printer is notably fast, too, at up to 200ppm when printing or copying at 1200x600dpi. The device boasts an automatic document feeder, too, and the high-speed USB 2.0 interface makes data transfer faster, while installation is easier. It is easy to replace the all-in-one Canon MF-5750 toner cartridge belonging to the Canon LaserBase MF-5750 as this compact cartridge combines both the toner and drum units in one supply. Although the Canon LaserBase MF 5750 is aimed at professionals, it is not a convenient choice for workgroups that need to share a printer. The MF-5750 laser printer requires the AXIS 1650 print server, which is sold separately. Photo and graphics output are not the best, while the scanner of the Canon LaserBase MF5750 may not produce the most accurate output.